A vintage/antique 1920s groceries sign. Another gem to add to my sign collection! Are you a sign fan? 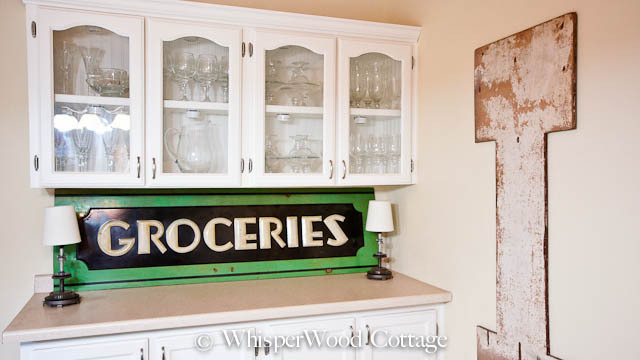 How have you used signs in your decor? What a fantastic sign - I love the font. WOW....lucky girl! What a great sign. I usually have to just make all mine I haven't found any affordable ones YET...I have hope!The color is wonderful! That is beautiful! I'm the same green with envy! LOVE, LOVE your sign - AWESOME find!! Oh man, she is a beauty. I can see she you have her displayed so prominently. That is really neat looking! It looks like it fits that spot perfectly, too! Oh my! What a find! It gives me inspiration for making my own sign. Love your Grocery sign - the green is perfect! I've been collecting vintage and antique signs for-ev-ah. 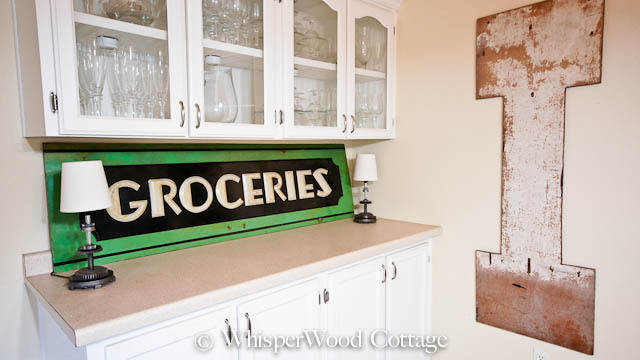 Your embossed grocery sign is a wonderful addition to the WhisperWood Cottage! Great sign and I like where you have it displayed. I recognized your sign immediately!! It's from a Kroger grocery store. I have some photos/links that would give you some background on your sign. If you'd like me to send them to you, let me know how to contact you. I didn't know if I should post links in a comment or not. What a great sign....those grocery signs are so hard to find!...Would love one!....I am hoping the right one for me is around the corner! Looks fantastic in the kitchen...the colors are amazing! I would have snapped that up myself, the colors are fantasic! What a great find- I love the colors! Amy, I LOVE this sign! I'd love to find an authentic old sign similar to yours. I've come across a few but they have been more than I can afford. Your Groceries one though would be hard to pass up...love the way it's under your cabinet there...looks like a perfect fit. I LOVE your new sign!!! I would move my stove out of my kitchen if I found a sign like yours! It's not being used much anyway. Enjoy! What a great find! I love it!